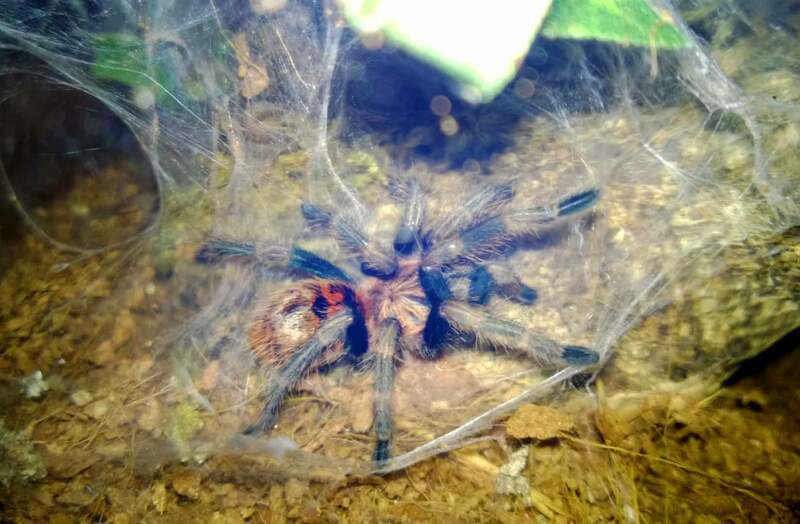 A couple months ago, I saw a listing for Lasiodora itabunae slings on Ken the Bug Guy’s website, and I was immediately intrigued. I hadn’t heard of this species of Lasiodora before, and some research didn’t bring up much in terms of first-hand reports on their upkeep. Either they were fairly new to the hobby, or just hadn’t caught on with enthusiasts. As I own three Lasiodora parahybana’s and love them, I decided it would be fun to try out one of its relatives. I ordered what was supposed to be a 1.5 inch L. itabunae, but I was pleasantly surprised to discover that my new acquisition was just over three inches (thanks for the upgrade, Ken!). At the time, the spider was a light, reddish-brown with a very bald, fleshy-toned abdomen. I set him up in his new enclosure, and he ate immediately. I was instantly impressed by the ferocity and speed in which it attacked and subdued its prey. 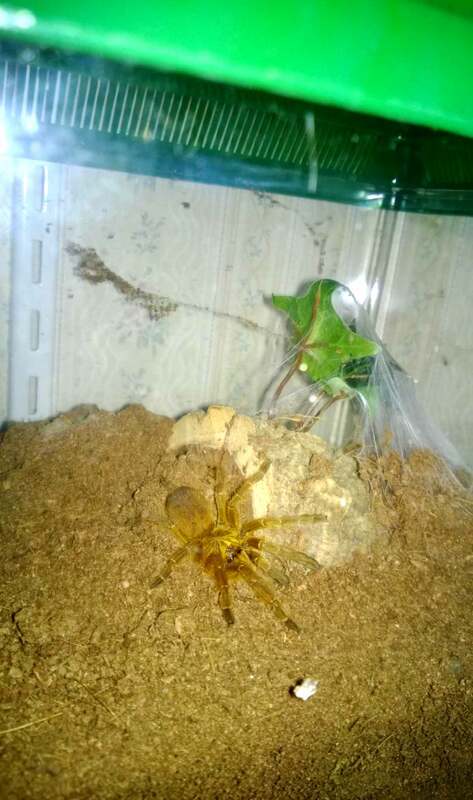 After reading a handful of firsthand husbandry accounts, I set the enclosure up identically to my L. parahybana, with a cork bark hide, dry coco fiber substrate deep enough for burrowing, and a water bowl. Temperatures are about 70 at night and 78-80 during the day. When watering it, I let the water overflow a bit, but I never spray it for humidity. It became apparent very early on that this spider was going to be a voracious eater. It spent only a week hiding meekly in its core bark burrow, then it sat boldly on top of it, seemingly waiting for me to drop a cricket in. Twice, it caught the prey before it could hit the substrate. The other times, it would bolt across the cage, snatching the cricket in the blink of an eye. Next to my P. cancerides juveniles, this might be my favorite T to feed. My 4+” L. itabunae likely waiting for its next meal. About two weeks ago, my itabunae molted, and the transformation was amazing. Not only did it pick up close to an inch of size, but it also sported brand new colors. The reddish-brown was replaced by a beautiful steely blue, and its abdomen was now highlighted by red hairs. 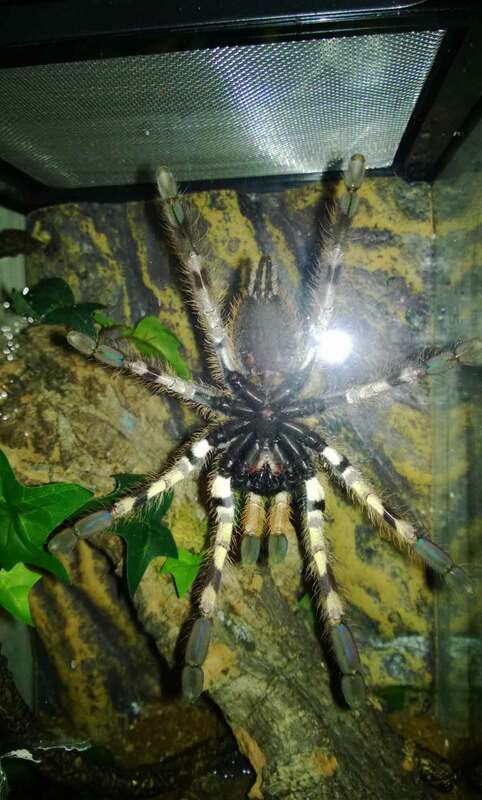 He’s a truly gorgeous T.
My L. itabunae stretching out after a recent molt. For folks interested in large terrestrial Ts with easy care requirements and an awesome feeding response, consider L. itabunae. I will definitely be looking to acquire more slings of this amazing species. 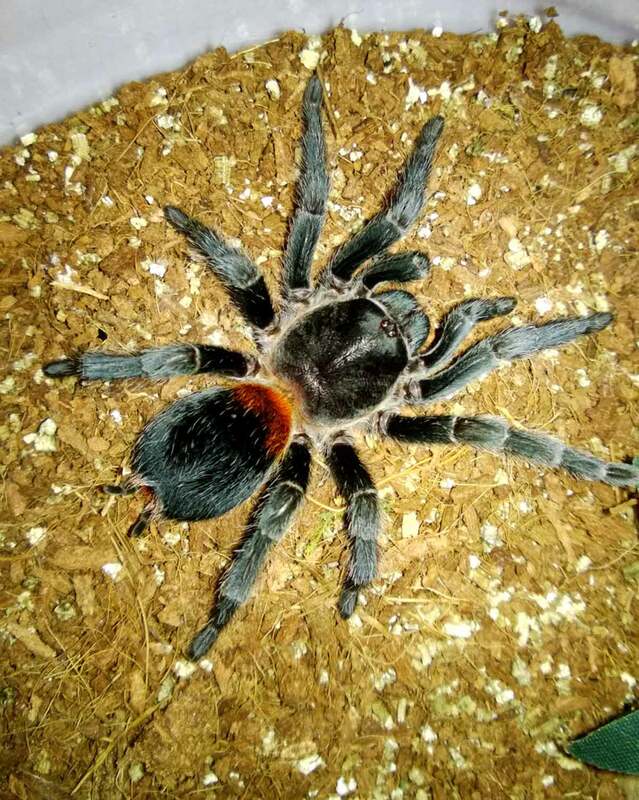 A sleek, secretive Tarantula, and a unique-looking species, the Oprhanaecus philippinus, or Philippine Tangerine, is a species that should enjoy more popularity in the pet trade. 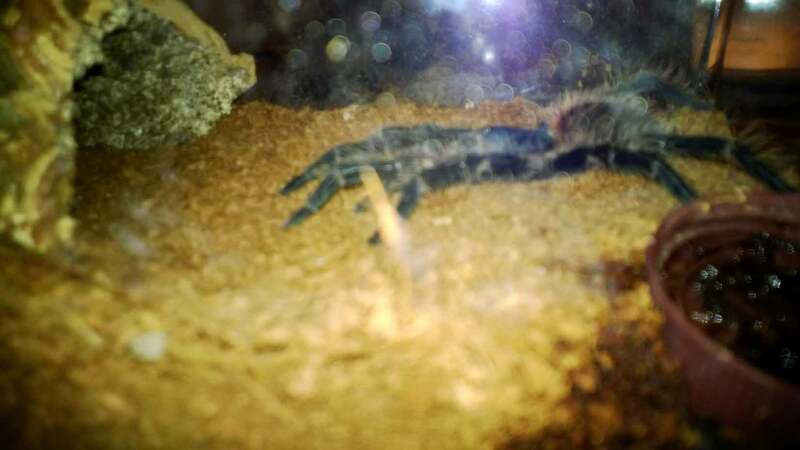 From the Philippines, this old world tarantula and obligate burrower thrives in warmer and more humid conditions. Unlike many terrestrial species, O. philippinus have lithe frames with long, slender legs, a pill-shaped abdomen and an overall sleeker build. At a max length of around 6″, this is an impressive animal. A gorgeous orange/tangerine color overall, these Ts have shorter hair, which gives them a very soft, velvety appearance. 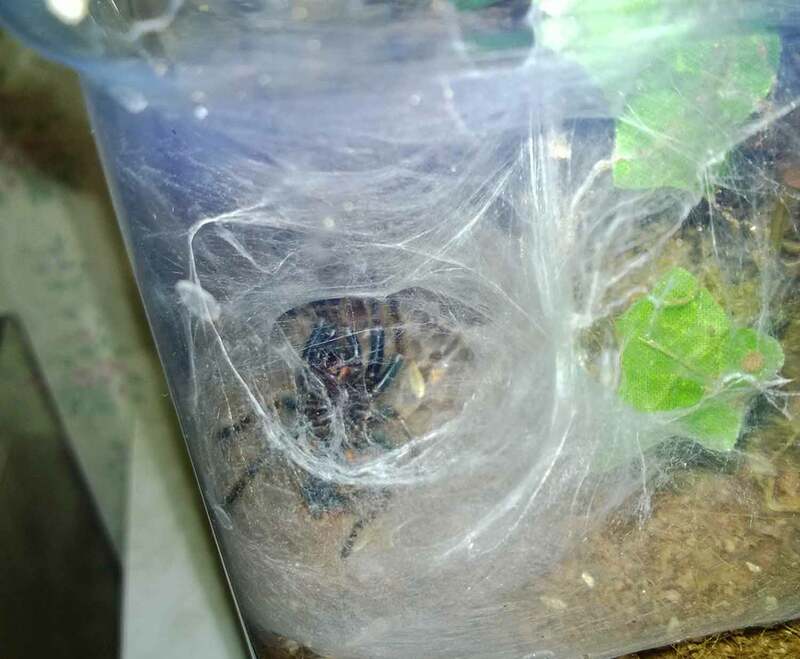 My 2+” O. philippinus hiding in its den a week after molting. Despite being an old word species, my O. philippinus slings would much rather flee to their burrows than stand and fight. They are obligate burrowers, and they require deep substrate so that they can construct suitable dens. This is a species that requires a more humid climate, and for them to thrive, they do need slightly moist substrate. When presented with two starter dens, one on the dry side of the enclosure and one on the moister side, both of mine chose the moist side to create their homes. 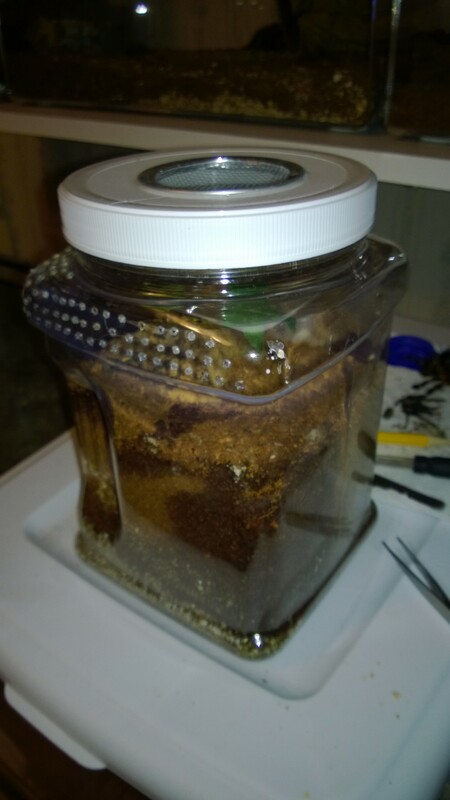 For substrate, I keep them on a mixture of coco fiber and peat moss with a bit of vermiculite mixed in on the bottom to help maintain moisture. I will then sprinkle water in occasionally to keep the surface just a bit moist. The majority of the water will percolate down the sides of the enclosure keeping the lower levels more damp than the upper levels. This allows my T to burrow and chose the level of moisture it needs. I also allows for water to evaporate more slowly, keeping the humidity up. Once its den is constructed, the O. philippinus will wait just inside the entrance hole for a prey item to stumble by. When the unfortunate insect is sensed, the O. philippinus will launch out of its hole, ambushing the insect and grabbing its meal. It will then drag the item back into its den so that it can eat in private. In my experience, they are voracious eaters who will only refuse a meal when in premolt. 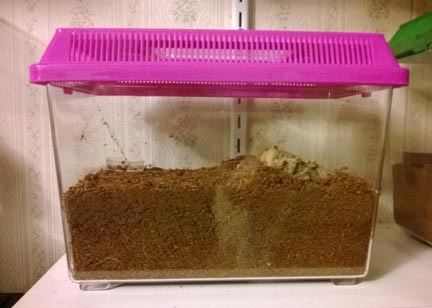 When mine were about 2″, they had no problem taking down larger crickets. I feed them appropriately-sized cricket or roach every three days or so. As far as a downside for these wonderful creatures, there are few. Humidity and moisture requirements can make the husbandry a little trickier. Moisten substrate too much, and you run the risk of creating hospitable conditions for mold and mites. Keep it too dry, and your O. philippinus is likely to dehydrate. Moist substrate AND proper ventilation is key. They are also VERY fast, and can go from crouching in a corner to out of the enclosure in a blink of an eye. Keepers not used to keeping faster species could find this shocking. For temperatures, they are kept at mid to low 70s although they will thrive at temps in the low 80s as well. As with most species, higher temps will bring faster metabolisms and growth rates. I’ve kept mine for about a year, and in that time they have gone from 1.25″ slings to 3.5″ sub-adults. I have not noticed a significant difference in growth rate between the winter months where they are kept mid to low 70s and the summer when temps are high 70s to low 80s. http://www.youtube.com/watch?v=nLGd8t02hsk Because they spend the majority of the time in burrows and normally venture out only at night, sightings of your prized pet may be rare. Personally, I enjoy the thrill I get when I catch one of my slings out and about; or when I witness one snag a prey item. 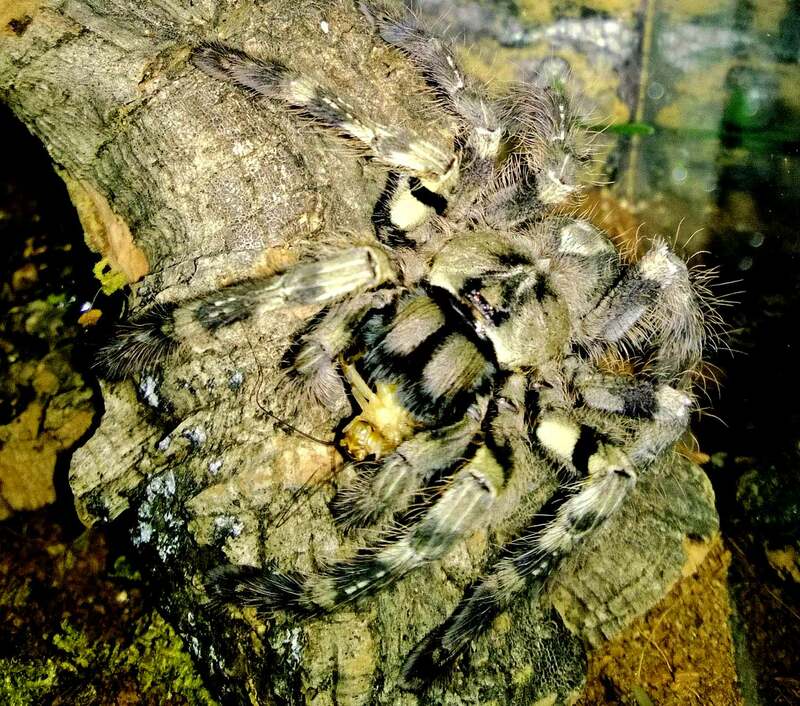 They are an amazing , beautiful, and unique tarantula that would make an excellent addition to any collection. Perhaps one of the most fun facets of T keeping is the never ending quest for the perfect tarantula enclosure. Whether you’re a money-is-no-object keeper interested in assembling the most aesthetically pleasing enclosures, or a more frugal enthusiast who wants to save precious funds for future spider purchases, there are literally thousands of options available. Once you are thoroughly hooked on the hobby, you will find yourself wandering the container section of your local Dollar Tree, Walmart, or craft store measuring up plastic canisters for size, price, and alter-ability. And, for your “showcase” spiders, there are many attractive options that won’t break the bank. As I’ve done a lot of experimenting with enclosures, both professionally constructed and “found” varieties, here I will present some of the ones I’ve continued to use along with some of the pros and cons. These enclosures are listed in no certain order. 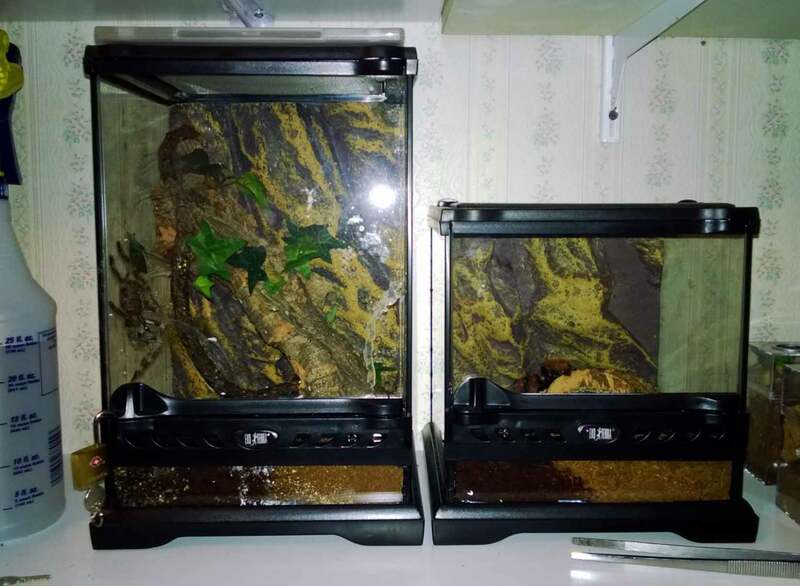 For keepers looking for a more attractive home in which to house their Ts, but who don’t want to pay upwards of $100 for a cage, Jamie’s acrylic tarantula enclosures are fantastic. 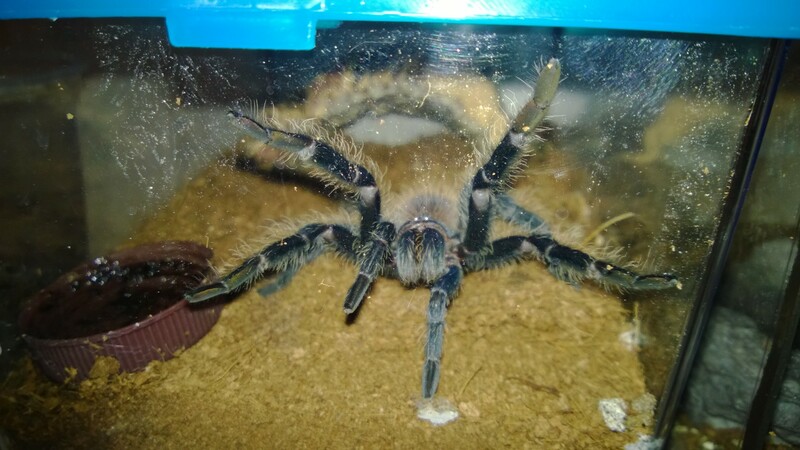 These 8″x8″x14″ cages are perfect for most large tarantulas sized 4″ to 7″. She offers the option of purchasing just the cage, or you can get the Complete Cage package with all the fixings for $20 more. The crystal clear acrylic offers complete viewing from all angles, and the hinged door can be locked for security. Also, I have found these enclosures to be much more durable and well-constructed than other acrylic enclosures I have used. 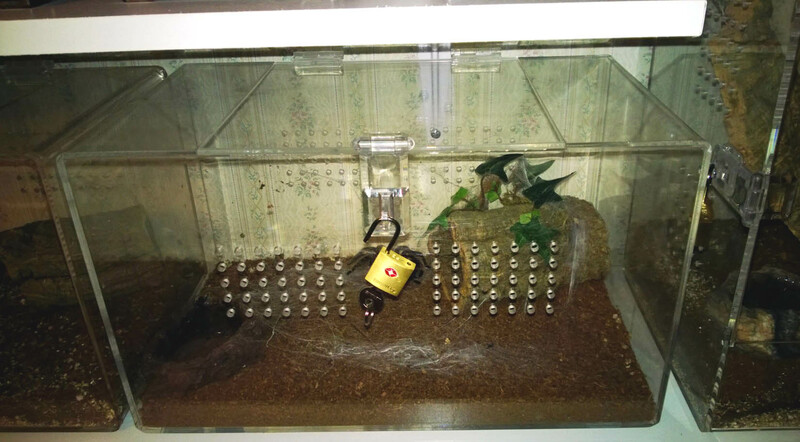 Acrylic tarantula cage from Jamie’s Tarantula – Terrestrial set up. Even cooler, the cages are specially designed so that they can be used as both terrestrial OR arboreal cages. I have three of these beauties; two house terrestrial Ts, and the other is set up for my arboreal A. metallica. The air vents on both sides allow for good cross-ventilation while keeping in precious humidity. Both sizes are offered in either Terrestrial and Arboreal versions. 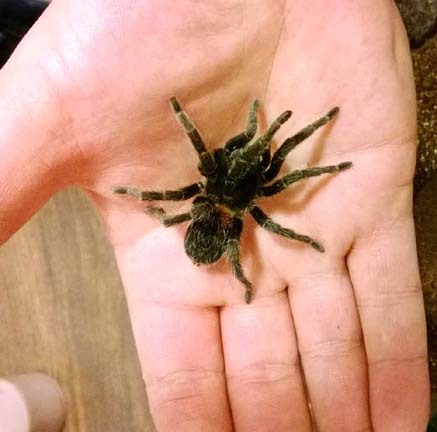 For slings and juveniles, Jamie also offers Spiderling and Juvenile Enclosure kits. These wonderful and affordable cages come with all of the fixings (substrate, moss, silk plant, cork, and water dish for the juveniles), and they are often offered as a package deal with a sling or juvie. I’m particularly enamored with the spiderling kits, as the offer great visibility and seem to limit the chance for escape when opening for feeding. When buying from Jamie’s, I also find it incredibly convenient that I can get my sling and the enclosure at one place. 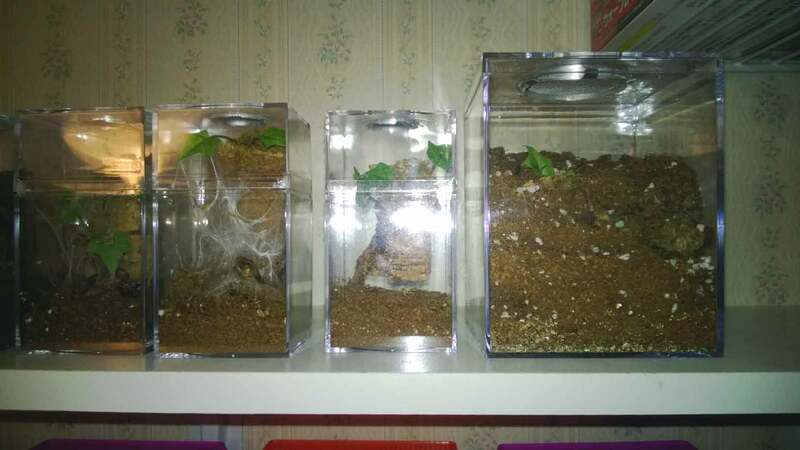 Spiderling and Juvenile Enclosures from Jamie’s Tarantulas. These are sold as kits with all of the fixings. These all-purpose terrariums are gorgeous, and with prices starting at $34.00 (or even less expensive if you catch them on sale on the Petco website). The black framing looks very sharp, as does the foam faux-rock background. These tanks also offer two ways to access them, with both a front door and a removable screen top. It should be mentioned, these are not designed exclusively for tarantulas, and some models suffer from some design issues that make then less than ideal. For example the unique venting system beneath the door prevents owners from packing in more than a couple inches of substrate in the bottom. 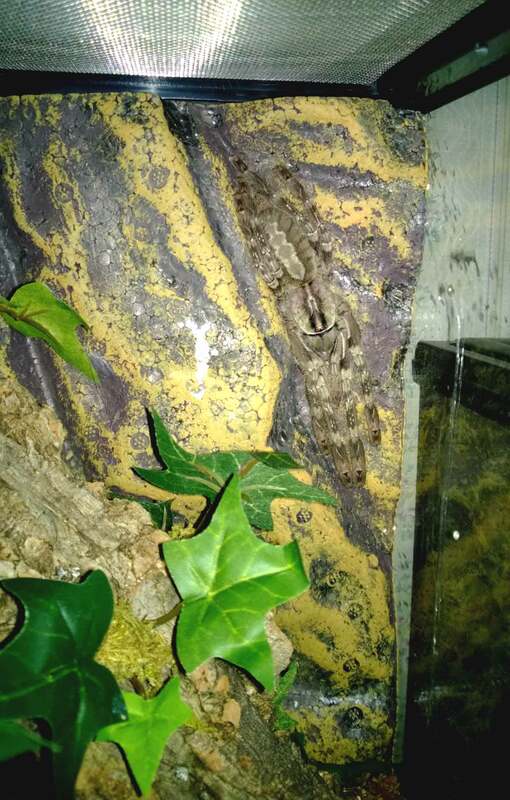 With 5 or more inches of space between the top and the substrate, a plump climbing terrestrial T could fall and injure itself. An Exo Terra Nano Tall (left) and regular 8 x 8 x 8. Also, the screen top can be a problem for terrestrial Ts whose legs can become stuck in it. To combat this issue, the cage top can be altered by ripping out the screen and replacing it with Plexiglass with several breathing holes drilled into it (see below). The top of a Exo Terra Nano, modified for a terrestrial T. The screen has been removed and replaced with ventilated Plexiglas. The Exo Terra Tall, on the other hand, makes a fantastic home for an arboreal with no modifications. 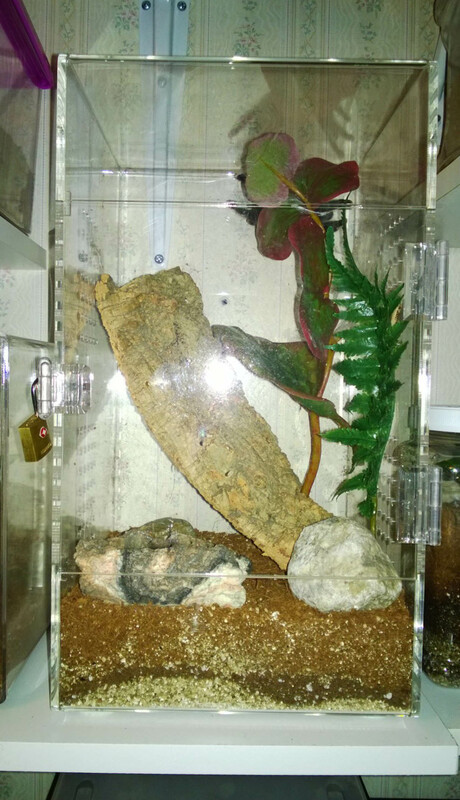 The 8″x8″x12″ tall enclosure is the perfect size for a medium arboreal species, and makes for a stunning display. For species that require a higher humidity, you can block off part of the screen top with saran wrap or plastic (as I have done with the one housing my P. vittata), to slow evaporation. And, for a T who may get 7″ or longer, the larger Exo Terra Mini Tall (12″x12″x18″) will do. These larger models feature two opening doors, which can make cleaning or feeding faster species a bit easier. These clear plastic containers with colored plastic lids are produced by several different companies, come in many different sizes, and are made to house small animals including hermit crabs, fish, reptiles, and insects. They also happen make quite good homes for tarantulas and have become a staple for keepers looking for attractive, low-cost enclosures. Medium Sized Kritter Keeper/Pet Keeper. I use these to house my juveniles. 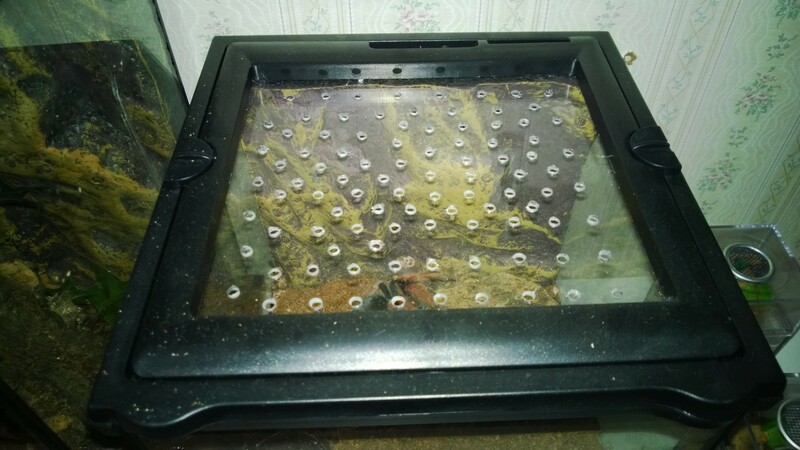 These nifty little cages are great for burrowing Ts due to their depth, and the covers have wonderful little windows on the top that double as a feeding hatch. They can be found online through Amazon and Petco.com (Once again, Petco’s sales and free shipping can really make these a steal), and Walmart even carries the medium sized cages in their fish section. As for cons, there are only a couple issues. First, larger holes where the handle connects to the lid, and another round hole meant for running tubing, can both be potential escape routes for small and determined Ts. It’s best to fill these three holes up with a little hot glue before using the enclosure. Also, because the entire lid is vented, water and moisture will evaporate quickly in the winter months. To combat this issue, use plastic wrap and tape to close of some of the vents. The go to enclosure for T enthusiasts with huge collections. These plastic containers come in just about every imaginable size, and they are generally quite inexpensive, with many of the larger sizes going for less than $3. Sterilite even makes a set that locks securely and is designed to stack (see photo below). To make the ventilation holes in cages meant to house slings, there are a couple alternatives. The easiest is to use a soldering iron (the one I use was about $10 on Amazon, and has been a dream). The tip of this iron comes to a conical point, meaning that you can use various levels of pressure to make any size hole you need. I can use just the tip to make tiny holes for small spider enclosures, or use more pressure to make up to .24″ holes for larger ones. A more time-consuming way to create the holes is to heat a very small nail on an oven burner, pick it up with pliers and use it to melt holes through the plastic. I will actually use several nails on a burner so that I always have a hot one ready. You can usually put three to five holes in before having to trade nails. A word of caution: make sure to have adequate ventilation, as the plastic fumes can be dangerous. For cages meant to house larger Ts, a power drill is the easiest and fastest way to perforate the plastic for ventilation. When positioning holes I try to create cross ventilation by putting some holes lower on one side and higher on the other. A Sterilite plastic container modified to house tarantula slings. For a step-by-step tutorial on how to create a custom enclosure using Sterilite containers, click! I love these plastic canisters. The 2-quart size is perfect for juvenile arboreals or terrestrial burrowing species. These inexpensive plastic jars can be found at any Walmart, and are easily ventilated using the hot nail method. As I wanted adequate ventilation, I used a 2″ hole saw and aquarium silicone to put a 2″ inch vent in the lid. Plastic canister modified with lid vent and side ventilation holes. There are dozens of these types of containers on the market; I just happen to prefer the Ziploc Twist ‘n lock for the wonderful screw on caps. Like the other plastic containers, these can be vented using the hot nail method. The small containers are perfect for terrestrial slings, and the taller medium sized ones are great for arboreals in need of climbing room. 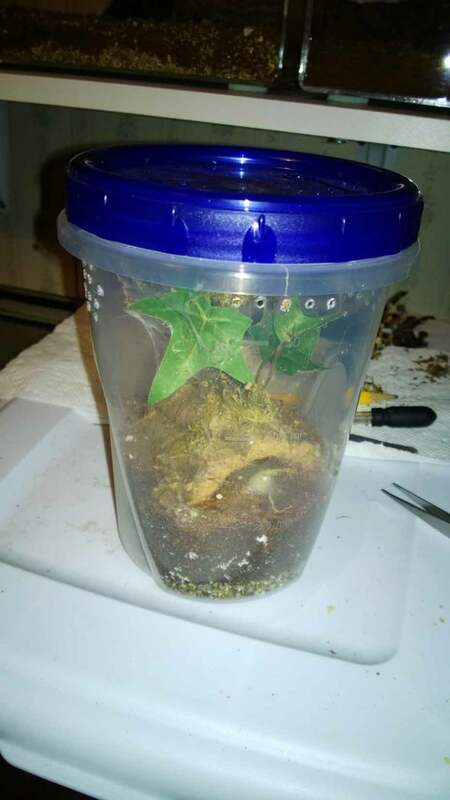 Ziploc container modified to house arboreal tarantula. At the time of this blog, I have several other containers that I will be altering and trying out as enclosures, and I will surely add to this list as I discover new possibilities. Also, I should point out that I did not include two of the most popular enclosures used by hobbyists. Clear plastic pill bottles and plastic deli cups are immensely popular due to their very low cost and practicality, and many keepers swear by them. It just so happens that I currently use neither, as I prefer Jamie’s spiderling enclosures. However, as my collection grows, and I get into breeding, this is likely to change. For a comparison of some Tarantula sling enclosure alternatives, click away! The P. murinus is quite infamous in the tarantula keeping hobby. 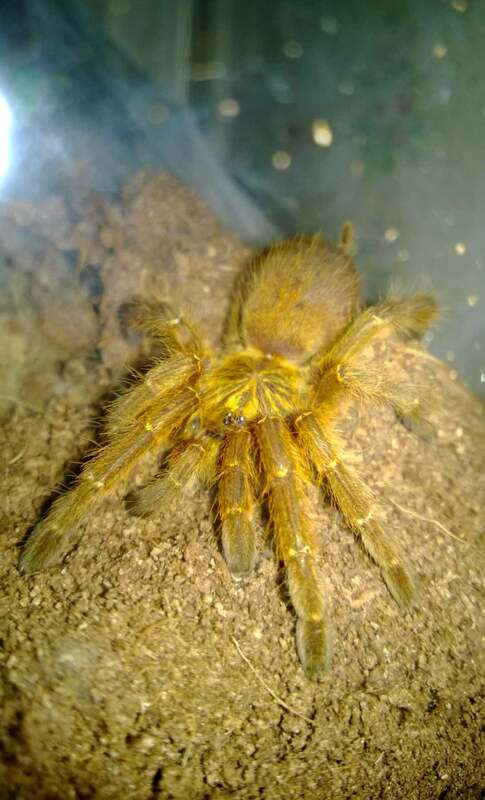 Referred to by the common nickname, OBT (which can stand for “Orange Baboon Tarantula” or the slightly more colorful “Orange Bitey Thing”), this gorgeous and hardy tarantula is known for its blinding speed, potent venom and highly defensive disposition. Unlike other Ts who would rather run than throw up a threat pose, OBTs are known to stand their ground, slapping with their legs and striking in all directions when agitated. 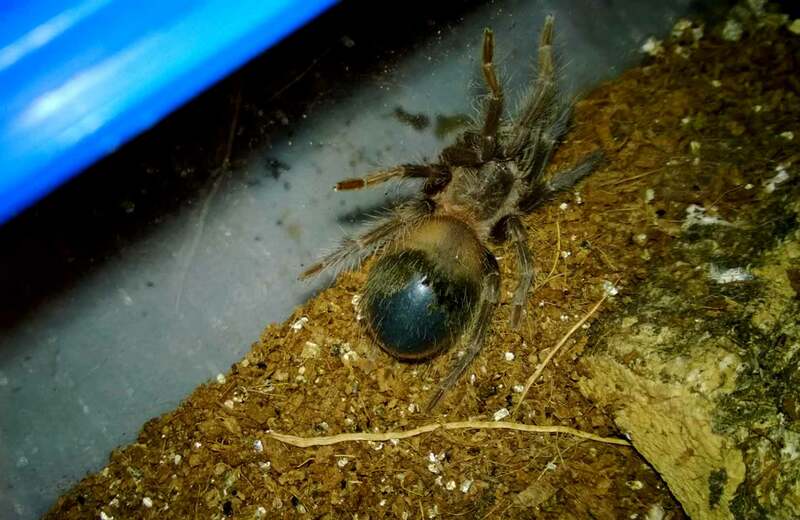 OBTs are said to be one of the easiest tarantulas to breed and, as a result, they are quite inexpensive and common in the hobby. 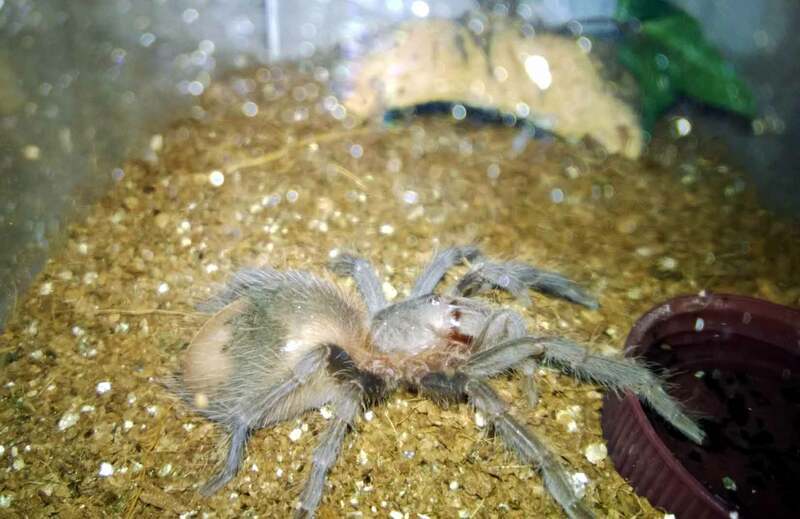 Most dealers carry the .5+” slings for $20 and under, and several will give out P. murinus slings as freebies. Folks who find themselves a recipient of one of these tiny, bashful chocolate brown slings will soon find themselves in possession of a bold orange ball of fury. 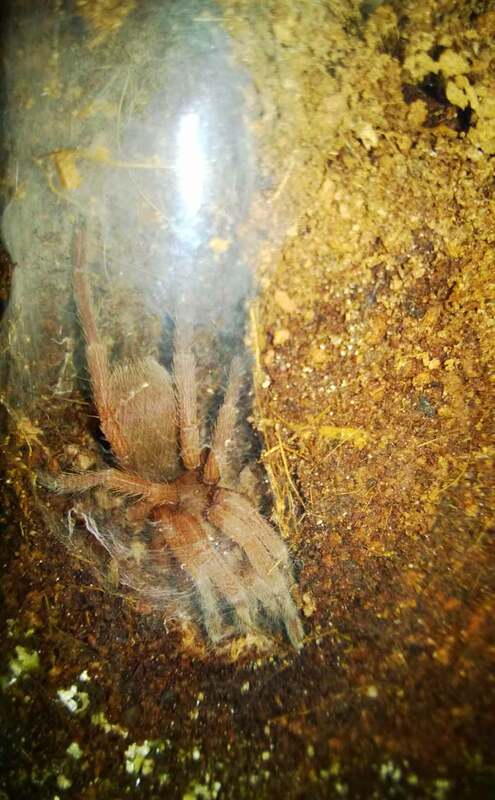 My P. murinus sling at about 1″. Notice the chocolaty brown tones. Their care is quite simple, leading to some folks mistakenly (in my opinion) referring to OBTs as a good starter species. They prefer bone dry substrate and enough substrate in which to dig, and they are generally recognized as being near indestructible. 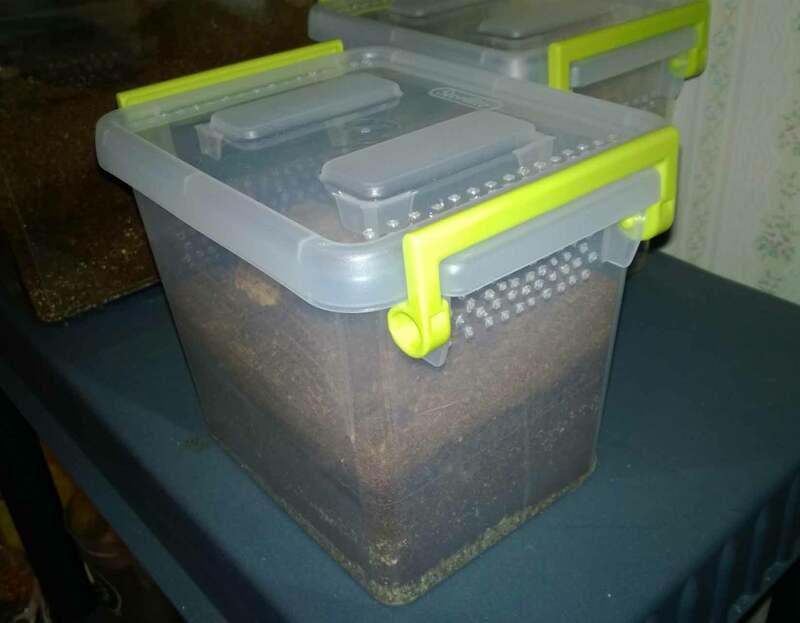 I keep my three on dry coco fiber with small water dishes in the corner of the enclosure. I’ve never seen them drink, and my female especially likes to drop her boluses in her bowl. Although this species is sometime called “semi-arboreal”, my three have constructed deep dens beneath the substrate. OBTs are normally prolific webbers, and they will often fill their cages over time with thick curtains of silk. A search on Youtube or Google will produce plenty of images and videos of industrious OBTs who have webbed up their entire enclosures. Although my sling is out most of the time, both of my juveniles have exhibited nocturnal tendencies, and I normally only see them out if I sneak down at night. My juvenile male, about 2.75″ taking a rare stroll outside of his den. All three of my OBTs are fantastic eaters, only refusing a meal when in premolt. In my experience, they have a medium growth rate, with frequent moltings but with less of a jump in size with each one. 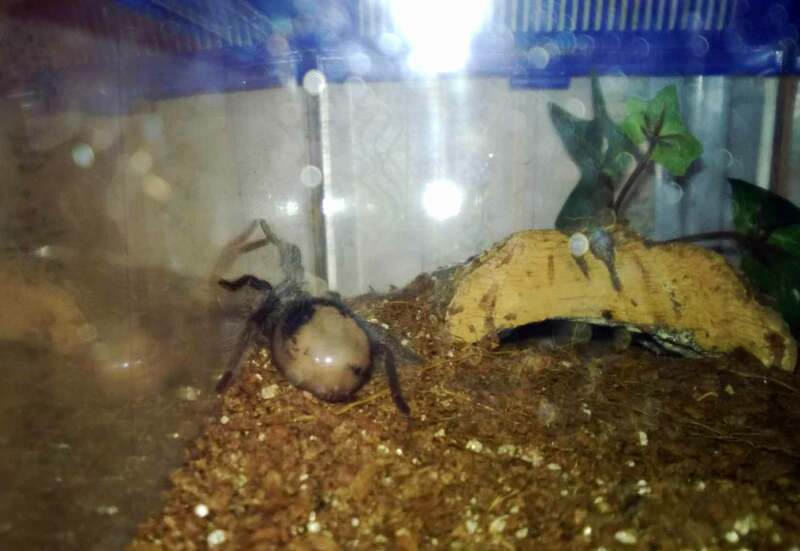 I purchased my sling at .5″ from Jamie’s Tarantulas in October of 2013, and it is now about 1.5″ after four molts. 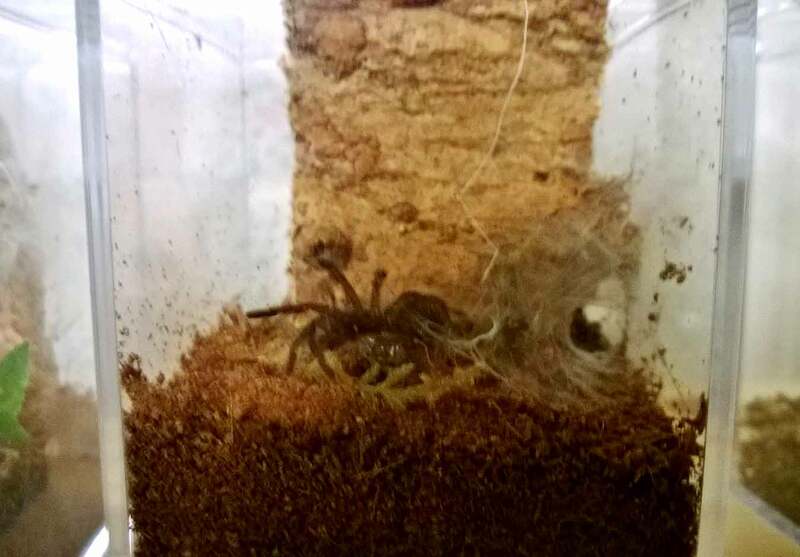 My juvenile pair, purchased from Arachnids RVA in December, have molted once each and are now just shy of 3″. The sling is still quite skittish, choosing to run and hide if I so much as tap its enclosure. My juvenile female, on the other hand, has no problem throwing up a threat posture if she gets caught out in the open (see video up above!). Still, she would much rather disappear into her burrow if afforded the opportunity. 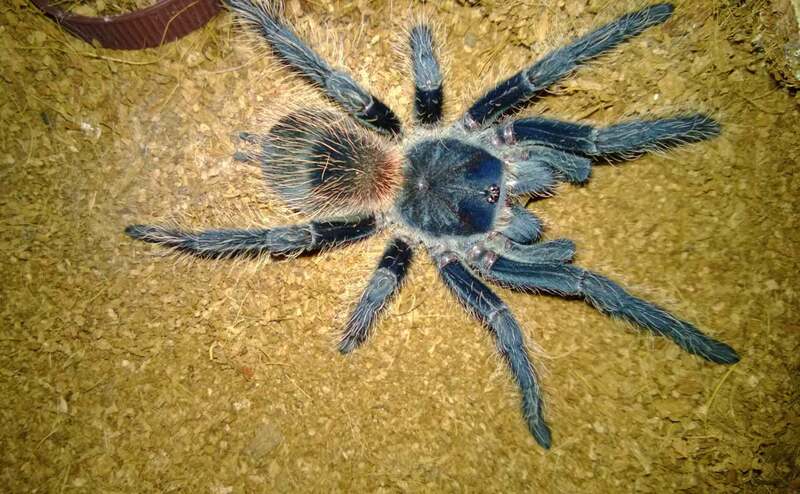 OBTs are old world tarantulas, meaning that their main defense when threatened is to bite. I don’t doubt that either of my pets would use his or her fangs if threatened. With its brilliant orange coloration and yellow starburst pattern on its carapace, the P. murinus is, in my opinion, easily one of the most beautiful tarantulas available. Its hearty constitution, ease of care, and availability also make for an enticing package. However, this is a fast animal, moving much more quickly than human reflexes can react to. And, being a defensive old world species, it will not hesitate to bite. 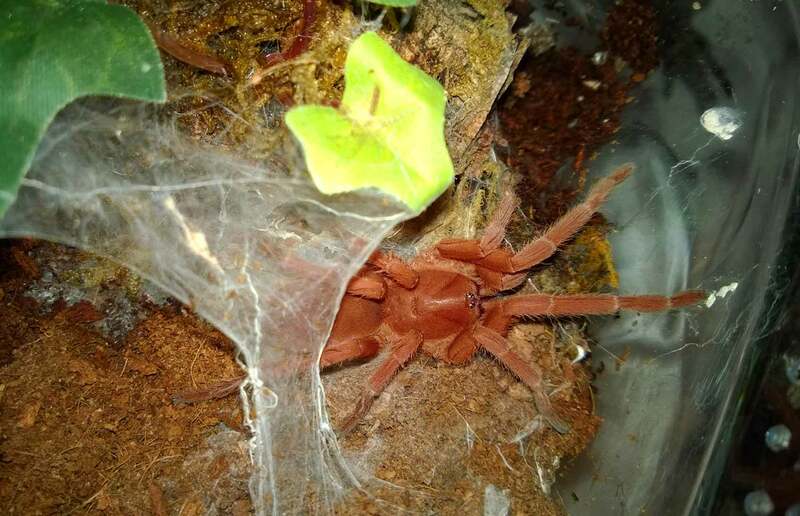 A quick search of OBT bite reports should make it very apparent that this isn’t a creature you want to get tagged by. Keepers who purchase this animal because they are amused by its ornery personality and dramatic threat displays and want to show their friends are really keeping it for the wrong reason. 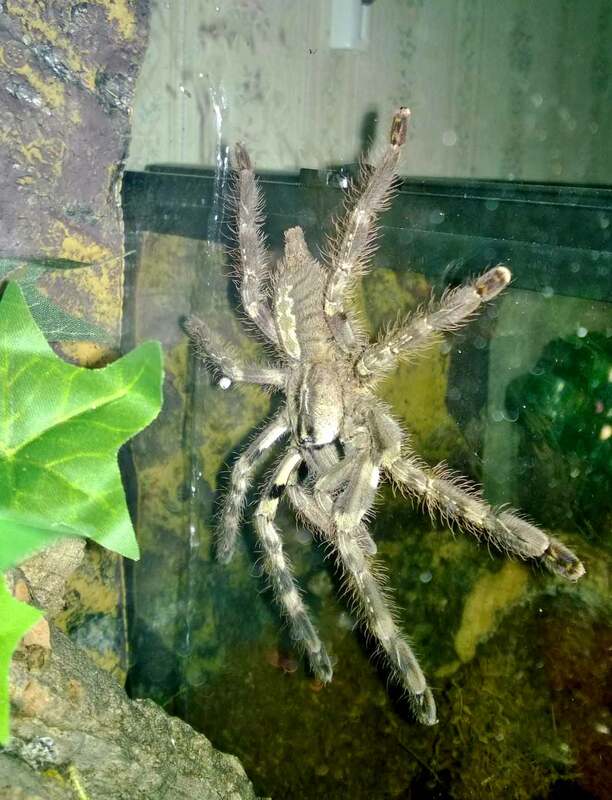 Although there are exceptions, most new keepers or first-time T owners would find the P. murinus to be a bit overwhelming to own. 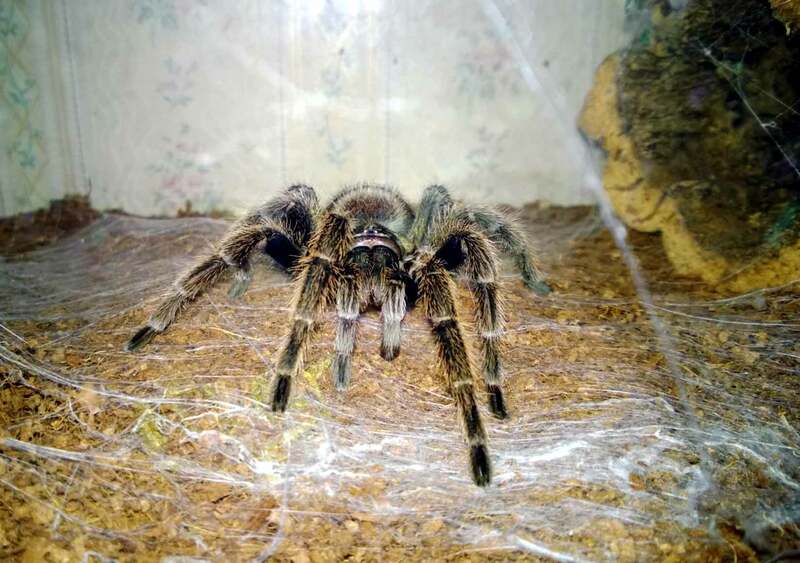 The message boards are full of posts by P. murinus owners who are terrified of their animals. Rehousings, cleanings, and feedings all have to be conducted with a great measure of care and concentration. 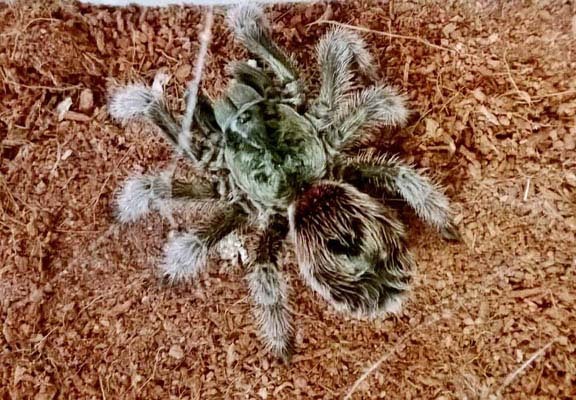 Those new to the hobby or unaccustomed to faster-moving tarantulas could soon find themselves with a pet they are ill-equipped to deal with.